When it comes to rescuing and preserving our endangered species, Colorado Parks and Wildlife staffers will trek to all corners of the state, day and night, good weather and bad, to fulfill their mission. That was the case December 13 as a CPW team from Denver and Colorado Springs drove hours to the far southeast edge of the state to make sure four black-footed ferrets were carefully and properly deposited in new burrows as part of the agency's ongoing efforts to rebuild a population twice thought to be extinct. April Estep, a wildlife biologist in CPW's Southeast Region in Colorado Springs, and intern Brianna Fett received the ferrets from the U.S. Fish and Wildlife Service, which had used them in a captive-breeding program launched to save North America's most endangered mammal. An estimated 300 live in the wild and depend on prairie dogs, the mainstay of their diet, to survive. As a dark chill set in, Estep and Fett got to work, carrying the crates with the chattering ferrets to burrows where staff had inserted black, plastic landscaping tubes so the captive animals would be comfortable entering their new homes. The cage doors were opened, one after another, and the ferrets nervously emerged. Each eventually darted down the tubes, which then were removed from the holes. "It's exciting and rewarding to be part of a project like this," Estep said. "Each black-footed ferret release is a special gift - one that can be scarce. So, this is really special." 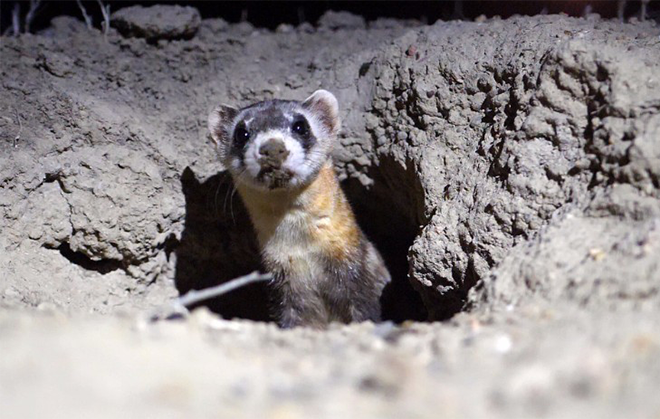 Ferrets were first reintroduced to Colorado in 2001 at Wolf Creek, north of Rangely. But that site succumbed to a plague outbreak and collapsed by 2010. CPW began a statewide reintroduction program in 2013. Since then, 300 ferrets have been released to six Colorado sites. It's too early to deem the program a success, but one colony had its first wild-born kit, or baby ferret, in 2015 and several sites have had more wild-born kits thereafter.